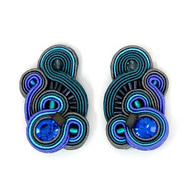 These earrings are killer standout, the colors are just so vibrant and draw you in! I often worry that studs would disappear in my dark, unruly hair, but these would easily pop! Buy at Charm and Chain for $170.